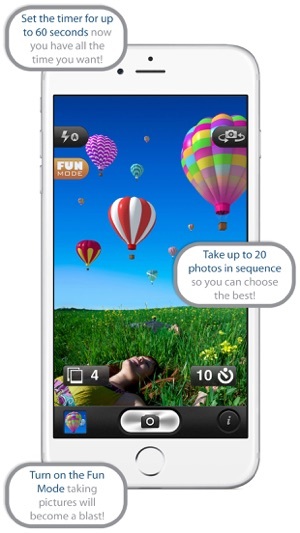 Place your iPhone or iPad, press the self-timer button and after the number of seconds that you decided the photos will be taken automatically in sequence. 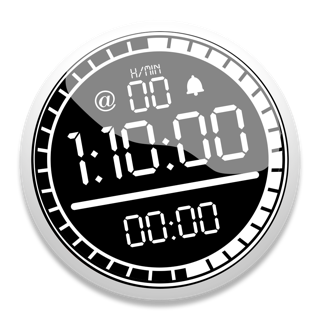 The standard time provided for the self-timer is ten seconds, but you can change it to three, five, ten, fifteen, thirty, or even sixty seconds. 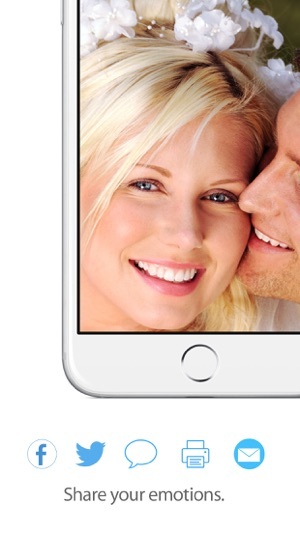 This feature is also very useful to prevent camera shake caused by contact with the iPhone while shooting. 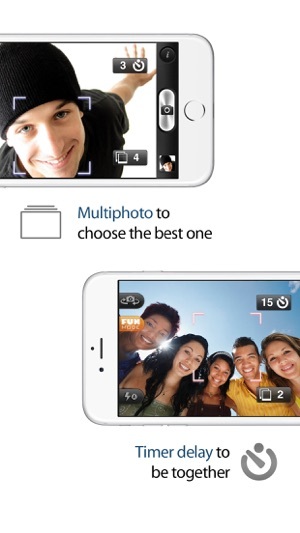 With the Multi-photo feature you can take a lot of photos in sequence and then choose the best to share. And if you want to get the most fun activate the Fun Mode, take pictures of the group will become a joke and finally your subjects are smiling. 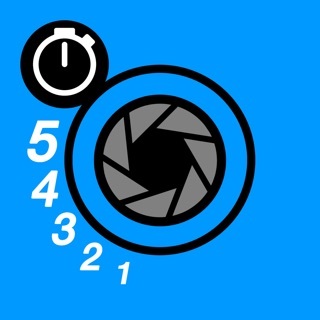 - Press the shutter button and after 3, 5, 10, 15, 30 or 60 seconds, the picture will be taken automatically. - Set shots in sequences of 2, 3, 4, 10 or 20 photographs: finally in at least one of the photos all subjects have their eyes open! 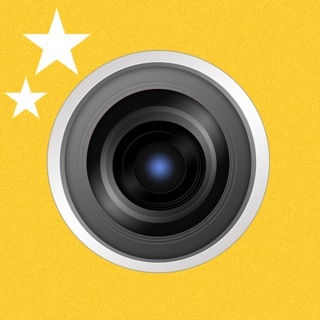 - Send your photos to Flickr, Facebook or Twitter, and all the major social media or directly print your photos. 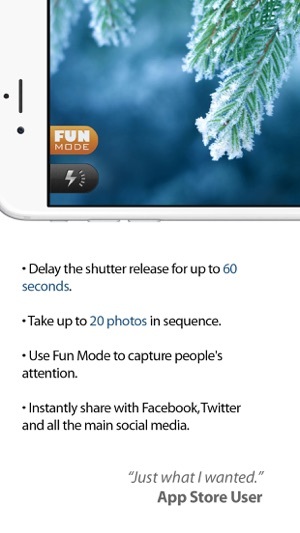 - Use Fun Mode to capture people's attention. I decided to leave my Nikon at home on a solo backpacking trip. The timer was easy to use and had enough settings to meet my needs. The ability to take multiple shots was a bonus. I did not notice any focus problems other than normal iPhone issues. A longer delay would be a nice improvement; but the current settings are fine for most everything. Nicely done app! My two wishes for an update are: for a way maintain the flash settings unchanged until you finish and shut the app off. It is quite time consuming to have to reset the flash to your specs in a shoot to continue to take shots in the same session every time you stop to check the photos and it defaults automatically to the preset. Secondly: A 30 second long timer setting would greatly help everyone who uses this very fine application! Great product! 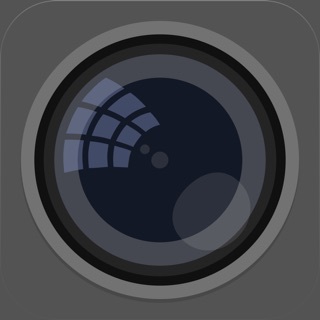 This App is simple, uncomplicated, does exactly what it says and it works flawlessly on my 3G. Some of my other self-timer Apps don't even have a preview and only give 3 to 10 seconds to position yourself. This one goes to 15 seconds and has preview. It was my lucky day when they posted this App for free for 24 hours. I would have paid for it but hey I'm happy:)) Thank You Developers!